After spending decades looking like the world’s least emotive Abercrombie & Fitch model, Barbie’s boyfriend Ken is finally getting a modern makeover. Or, rather—makeovers. 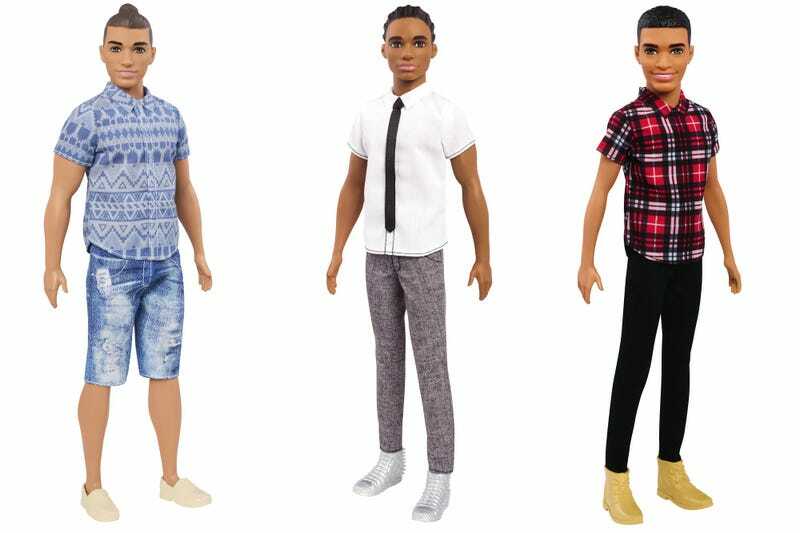 Beginning this year, you’ll be able to purchase a variety of different styles of Ken who’ve all been restyled to reflect the sorts of men that 2017 Barbie’s interested in spending quality time with. As revealed on Good Morning America, there will be 15 new Kens in total, using three different body types (“broad, slim, and original”), seven different skin tones, and nine different hair styles including corn rows and the aforementioned a man bun. Speaking to GQ Mattel’s lead on global consumer insights Michael Shore was clear that in the same way that every version of Barbie ranging from doctor to astronaut is still The Barbie, all of these Kens are The Ken. As insignificant as making Ken Asian or black might seem to some, there’s ample documentation of the impact that toys can have on how young children see and relate to the world. Barbie and Ken are massively influential cultural icons that we commonly associate with love, happiness, and success, things that everyone deserves a chance at having—not just cookie cutter white guys with square jaws and questionable taste in board shorts.